Please let us know what you think of Casa Irene: submit a testimonial! We LOVED staying in Casa Irene. We think we had the very best time of anyone in our group....and we've had to make them all promise that they won't rent Casa Irene from you on any trip when we're coming too. ...Hopefully we'll bring you lots more business for other times when they may visit. Your home had so many little touches that made it homey and comfortable...like our friends couldn't believe you provided clothes pins!! And towels, and shampoo, and coat-hangers and it was absolutely perfect for us. We loved meeting your kinfolk and knew they were there for us should we need them. BTW: LOVED the double opening doors on the bedroom. We slept with them and also the smaller door to the patio wide open every night. The fans were wonderful! The Macaws were magnificent and the first morning we were also greeted by dozens of Orange-fronted Parrot(keets). Caciques visited everyday as did Magpie Jays and Golden-cheeked Woodpeckers. The little wren is building a nest under the ficus tree and he serenaded us each day too. In short, your place is a paradise for folks who love nature and serenity. The trip was amazing! Yelapa was definitely everything I hoped for and more. Wonderful people, beautiful scenery. Your little book was really helpful, too. The house is lovely, and we definitely used the swimming hole! Kendra and Fernando were very welcoming and really helpful. The trip went off without a hitch. Thanks so much for having us! I can't wait to go back! the experience. 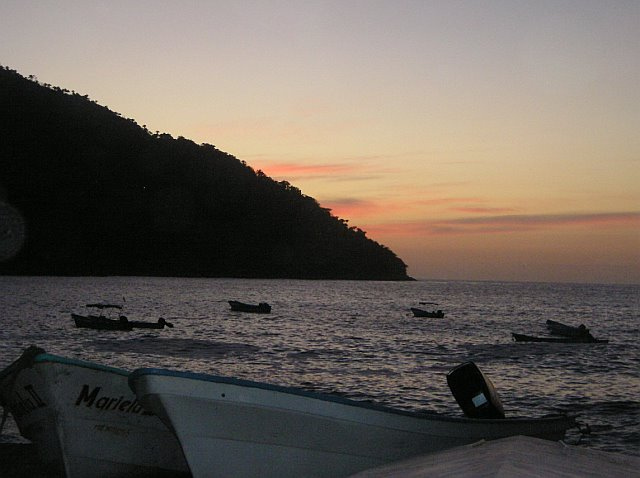 If I were to go back to the PV area I would certainly consider Yelapa again. I am, however, moving to the Caribbean in a couple of months, so the west coast of Mexico isn't going to be on my list again for a number of years. But I'm glad to have visited Yelapa, and we were pleased with our choice of Casa Irene. The one question everyone seems to ask is “Is it safe?” With all the negative publicity about drug lords in Mexico, people are understandably concerned about traveling there. If I were going to a border town or one of the cities known for drug problems, my answer might be different. However, I have traveled alone to Puerto Vallarta and Yelapa four times in the past year and felt totally safe. On my last two trips, I spent a lot of time in non-tourist areas of PV to shop for furniture and other items for Casa Irene. Other than braving turbulent ocean waters in a small boat loaded down with construction materials during a major rain storm, I never felt in danger in any way! Yelapa is remote, reachable only by a water taxi or private boat and access points are very public. There is not much there of interest to drug cartels! As anywhere in the world, there is some theft, but keeping an eye on your property and locking it in the “bodega” is all that is recommended. The people are generous with their help and with a large population of ex-pats in the area, people are accustomed and gracious to visitors from around the world. So, my answer to this question is always an emphatic “yes”. The story of how Casa Irene was conceived and constructed is here. Copyright © 2010 Casa Irene. All rights reserved.